“This Pumpkin Soup is my favourite!” exclaimed Mr 6 grabbing his spoon and digging in immediately. How amazing was Mr 6’s reaction to the lunch I served today?! Cue music, trumpets, a marching band and a parade! Ah, isn’t it so great when your kids love eating what you give them. And it’s even better when the dish is vegetable based. But one thing that picky pants Mr 6 does love is soups. 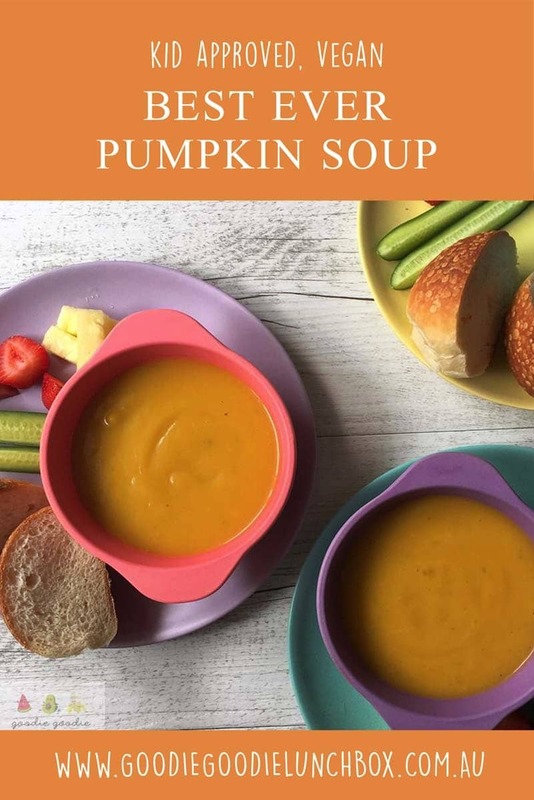 So I am loving the weather getting a little cooler so I can serve soups again, especially Mr 6’s favourite Pumpkin Soup. I think Mr 6 and I have similar taste buds. When I was a kid I hated pumpkin. HATED. Cue dry-retching and down right refusal to eat it. It must have made quite an impression on my lovely Grandmother, who, when I visited her a couple of years ago and stayed for dinner said she remembered how much I did not like pumpkin so had decided not to cook it on my behalf. But I do like pumpkin now. I remind myself of this when Mr 6 will not even touch roasted pumpkin. Or any food for that matter. I was just the same. In fact I think I did not even eat Pumpkin Soup. But I have learnt to enjoy it. Mostly. I still probably wouldn’t chow down on a bowl of mashed pumpkin. But I have made a lot of progress. And Mr 6 is learning to enjoy pumpkin too. Serve it as Pumpkin Soup – he is there, fighting you for the last spoonful. It’s the same with my Pumpkin and Coconut Muffins (totally delicious by the way). He adores them. 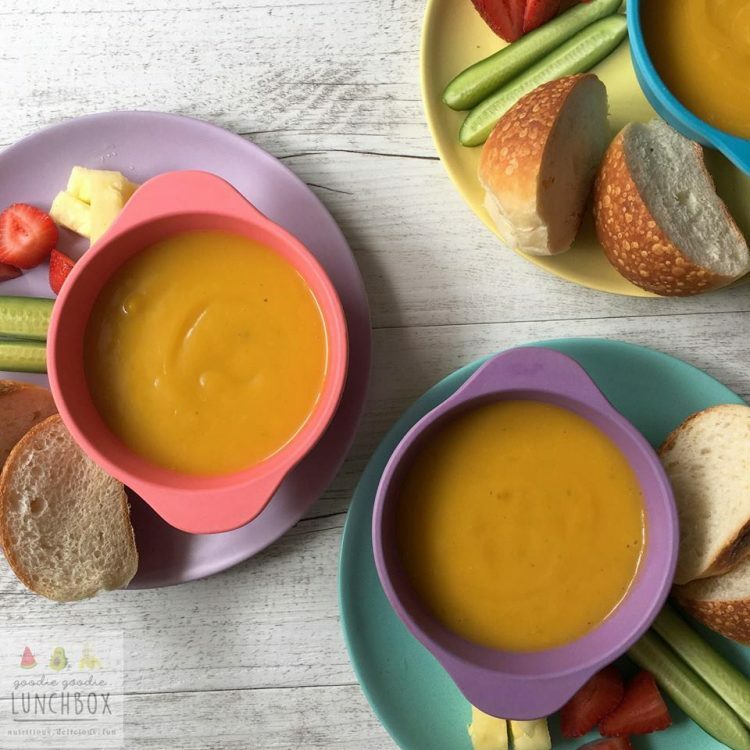 Have you served soup for school lunches before? It really is a great way to get some extra veg in the lunchbox. In those cooler months there is nothing better than a warm lunch and soup is always so comforting and nourishing. 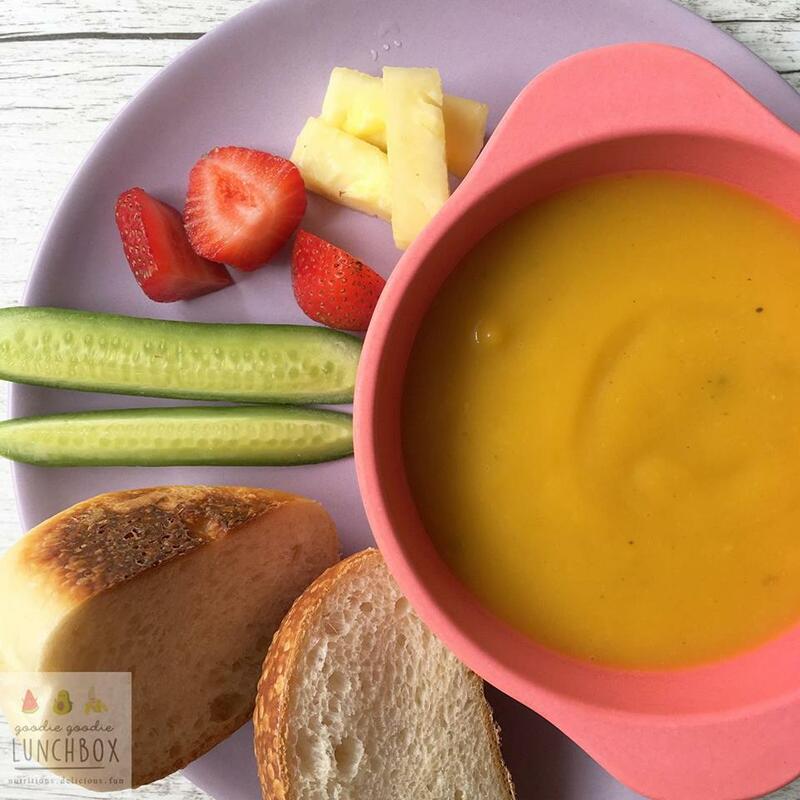 There are some really good insulated food jars and lunchboxes on the market and they are great to have for serving soup at school or for your kids to take hot foods to school. This year we are using an OmieBox that we received from The Bento Buzz. I had been coveting the OmieBox for a long time and am so happy to have this for packing soups this winter. It is such a great lunchbox, fairly deep so it packs quite a bit of food. The pièce de résistance however is the vacuum insulated container, perfect for packing soups and other hot foods. 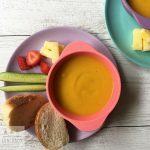 This kid-friendly Pumpkin Soup is creamy, thick and delicious. Perfect for lunch or dinner or fabulous for school lunches in an insulated food jar. Once the soup is at boiling point, turn the heat down to low and simmer for around 30 minutes until the potato and pumpkin have cooked through and are starting to fall apart. I hope your family will enjoy this recipe as much as mine do. It is a great lunch or dinner option. I hope you try this Pumpkin Soup in school lunches. 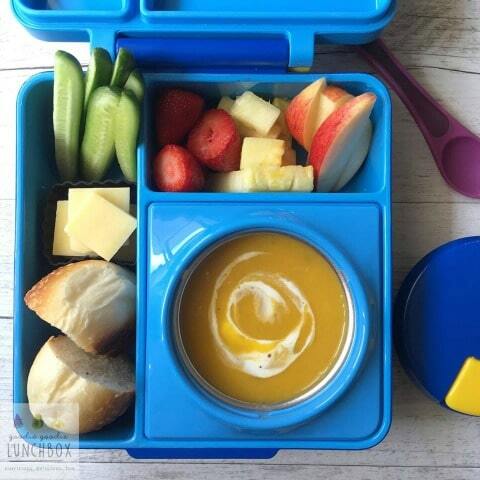 For more ideas for what to pack in school lunches check out my School Lunch Guide. Also if you are not already following me on Instagram, now is a good time! Head on over there and follow now and keep your eyes peeled for your chance to win an OmieBox courtesy of The Bento Buzz. Until next time, happy lunching! Hi again, how do u make veg stock? What special veg u put in them? Do you freeze that too? Thanks in advance. P.S Your kids are lucky to get such nutritional food made with so much luv.